Hey guys, I finally found something to wear in Blush that actually looks good on me! Last year this color was one of Pantone's colors of the year (except they called it Rose Quartz). I fell in love with this color but couldn't find it anywhere in the stores. Fast forward a year later, and this color is everywhere in stores! When I see this color I am instantly drawn to it. I grab the item, take it to the dressing room, try it on, and then go 'Bleh!'. I love this color on the clothing rack but hate it on my body. I then thought "Well maybe I need to try it away from face; like a pair of blush jeans or a skirt". But I couldn't find a style I liked. Then when I was at JCPenney a few weeks ago (where else?) and I found this cardigan! Oh, it was so pretty on the hanger, but would it just be another failure in the dressing room? With great anticipation I tried it on over my white tank and wow! I was ecstatic! 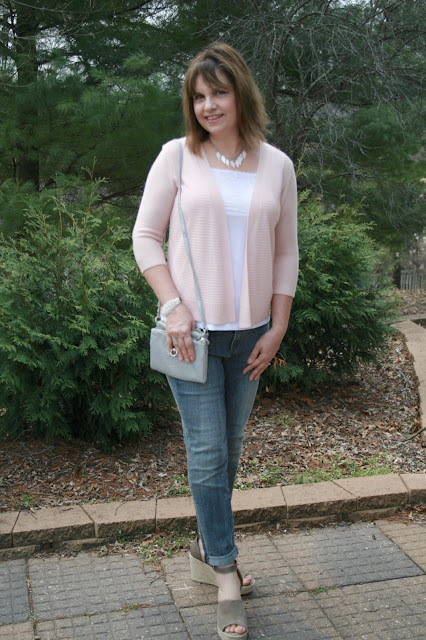 I finally found an item in the blush color that worked for me! Time for the happy dance! I believe this color finally worked for me because it's a cardigan and so whatever I wear underneath is what is directly under my face. I've always looked good in white, so the white tank worked well with my skin tone. The sweater is a nice, thin knit; my personal favorite. I only have one complaint about it and that is that I wish it were a tad longer because most of my tops are longer than the cardigan. 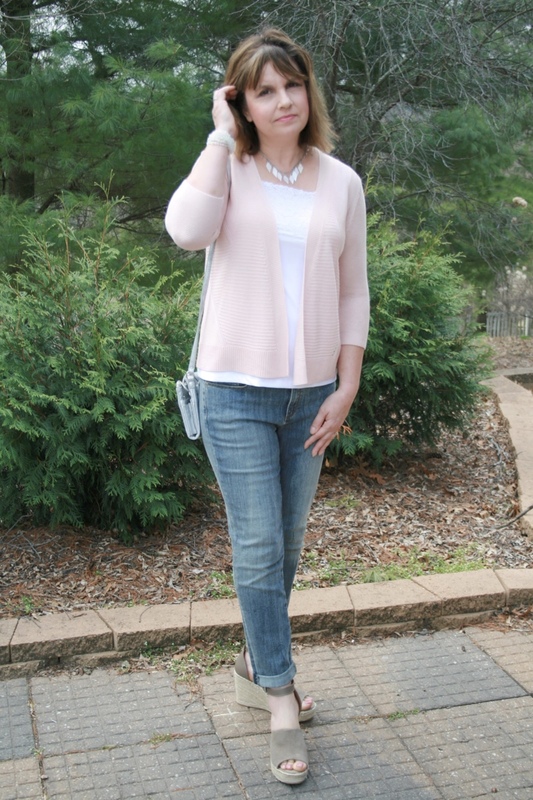 Some of the far away shots make the sweater look more pink, but it is a true blush color. The pictures below are more representative of the color in real life. The sweater has a very nice interesting design in it as well. Because I have a large bust, I have always struggled wearing tank tops. They tend to pull down on me and expose my cleavage. I recently found these amazing Lace Front Layering Tanks at CJBanks. They have a lace panel on the top and lace shoulder straps. CJBanks also sells a plain style that I love as well. They are made of a nice nylon and spandex material. The tanks go up higher (so no cleavage, yea! ), and they fit very well in the bust but looser in the tummy area so it's not clingy in all the wrong places. I have never been so happy with any tank in my life and I will never buy any other tank again except for these. I love them so much that I bought about ten more in all different colors (I bought all the colors that were on sale; some were as low as $6.99!). They are perfect for layering under shirts and cardigans. I picked up this pretty shell necklace at Charming Charlie's. And here are those Steve Madden Shoes again! Like I said, expect to see a lot of these as I love them and plan on wearing them all summer! The color of my cardigan is Rose Smoke. For size reference, I'm wearing a Medium. It's still available HERE and in other colors. I almost bought the white one too! My jeans are also from JCP. They are Liz Claiborne City-Fit Boyfriend Skinny Jeans. So what about you? Do you have any problems wearing Blush? Do you like this color? Do you own any blush clothing items, or are you still looking? I'd love to hear from you! Who care's which year this Rose Quartz came into trend, it's what looks good that counts and this colour is gorgeous on you Amy. Still one of my favourite colours and I'm aiming to wear it a lot! Thank you! It is a beautiful color! I love blush, but I also can't wear it by itself near my face. I'm wearing a blush top today that also has some darker colors. 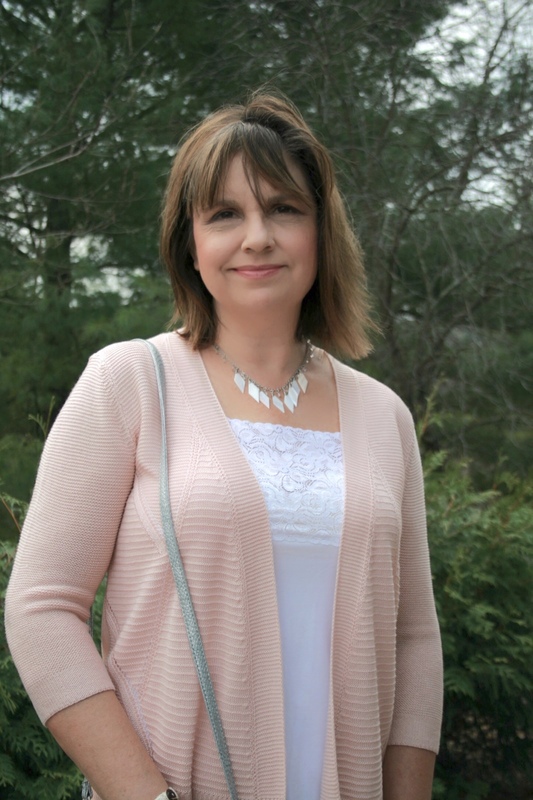 I'm also wearing a blush scarf with the same colors that are in the top. Since there isn't only blush near my face, it works. 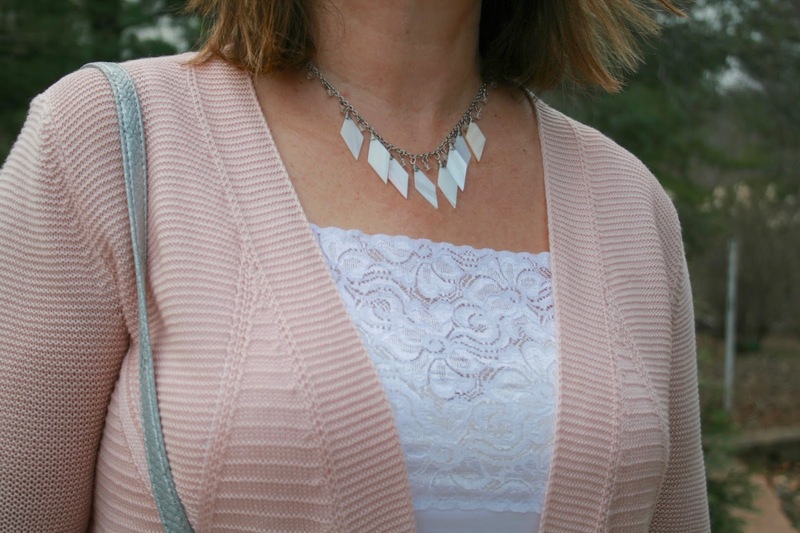 Your cardigan is beautiful and looks fantastic with the white tank. I really like the tank by the way and will have to look into getting one. Thanks Andrea! I'm glad to know I'm not the only one. My daughter says she doesn't look good in Blush either. Must be our skin tones. That is a pretty color, but I too don't think it looks good on me. Glad you found something that works for you, it looks great with the white tank. Really loving the pretty necklace too! 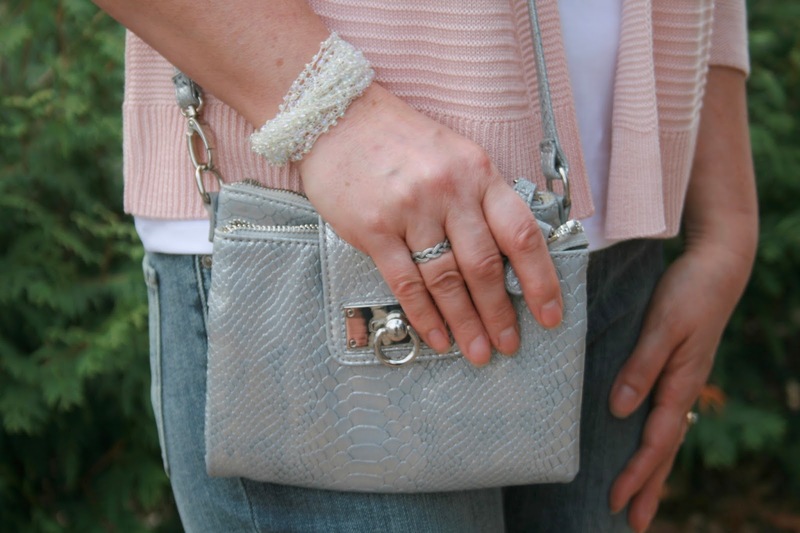 You always find the perfect jewelry to wear with your outfits! I'm starting to hear this a lot, then why is this color so popular if so few women can wear it? Thanks so much, I have so much jewelry! It's a hard thing to not buy and I can never get rid of any of it. Glad you finally found a blush item that works for you! It's beautiful with the lace detail in your top! 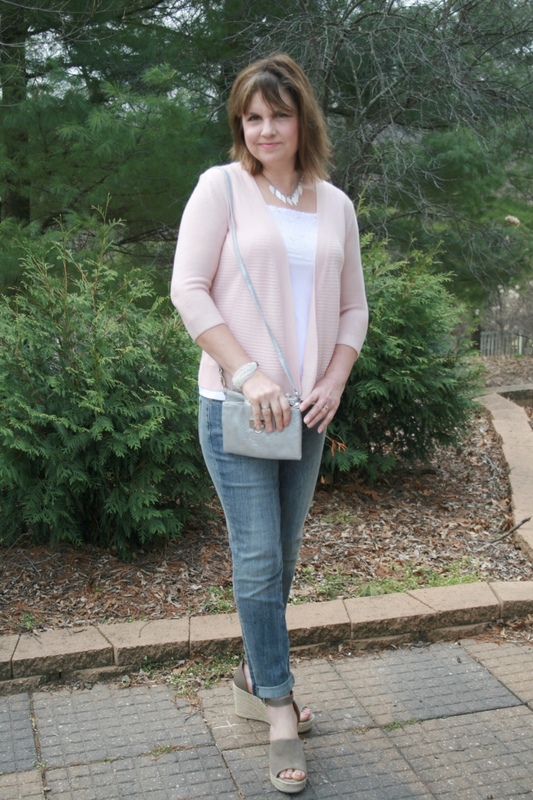 I'm loving this blush cardigan! 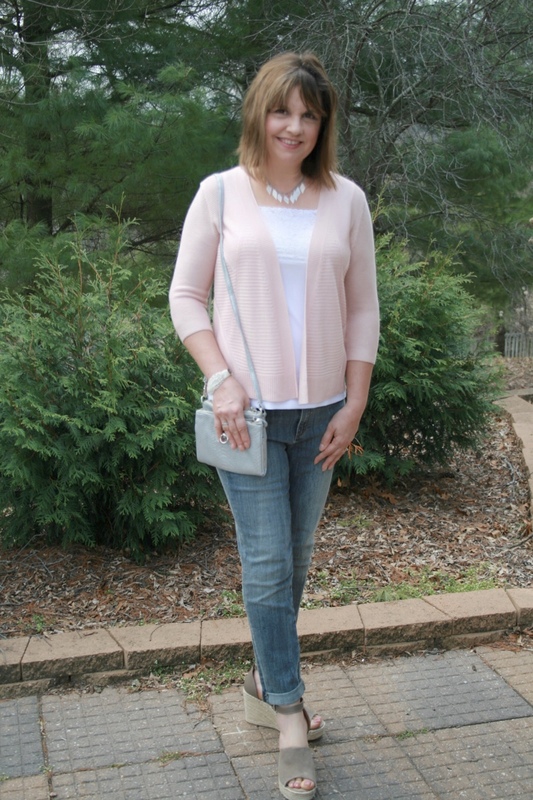 Blush is my favorite color, and I'm glad you found a way to wear it! Such cute wedges too. Your outfit looks neat and fresh and I love the detail in the cardi. A tan may help but that significantly reduces wear through the year. So you are so right, isn't it funny that a colour so popular is unwearable on most. There will be a lot of blush tops found in charity shops soon! It's comments like these that are the reason I blog: I learn so much from my readers! Such great tips! Thanks for sharing! Thanks for linking up to the Top of the World Style. You look so cute in this look! Love it! Thanks Jodie! It seems a lot of people have trouble wearing this color near their face. Thank goodness for accessories! You look fabulous in this. It's a gorgeous colour. I'm going to hunt for those tanks now as I'm too old for cleavage. Thank you! You will love these tanks! Love your blush cardigan! This is such a pretty springtime look! Those shoes are too cute! That style is everywhere! I also love how the color goes so well with that light pink. Thanks for linking up with Jennie and I for Fabulous Friday! Love tee blush on you! And the shoes are very cute. Chic look!